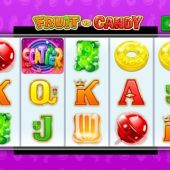 Fruit vs Candy slot is another 243-way game from the most prolific producers of them, Microgaming. The theme isn't Fruits and Candy but either one or the other as you choose the theme when you load the game. This choice also affects which type of bonus spins you get too. The symbols are all single accompanied by the standard card values as the lower pays. A pretty benign soundtrack supplies the background effects so will there be any sweet excitement? I chose the Candy Mode and the best paying symbol is the lollipop at 8.33x stake followed by what looks like a yellow Fruit Polo at 5x stake for 5-of-a-kind. There are Wilds on all reels with no sweetener in the form a multiplier though and further down the pays are gummy bears and jelly beans. The pays are always low on multiway games though and we have 2 random in-play features to make things a little more interesting. The 'Goodie Bag' randomly appears in the form of a sweetshop paper bag and reveals a cash win, usually 2 to 10x stake. The second one is the same as the T-800 feature on Terminator 2 slot but called the 'Sugar Rush Bonus'. After a spin, the game may attach cash values in turn to any non-card symbols visible on the reels, and if a scatter is there this will also trigger the free games bonus. Otherwise, to attain the bonus game 3 multi-coloured scatters are necessary anywhere in view. Fruity feature or sickly spins? If you are in Candy Mode you will get unlimited spins in which the candy symbols are stacked and and when landing in full on the reel turn the Wilds on that reel into stacked ones. The spins stop when all the reels have had a stacked candy land on them. Should you reach the maximum of 50 free spins you also get a cash prize awarded on top of your total. If you opt for Fruit Mode your free spins will continue until all the card symbols are removed. When the reels stop any card symbols will disappear, awarding a small cash prize in addition to any other wins you have on the spin. A counter tells you how many A, K, Q, J and 10's are left on the reels, and once all have been in view and converted to fruits, your spins end - usually very quickly.